Taking down the walls to the fourth bedroom adjacent to the Living, guests and residents are greeted by a generous spacious space when they come into this 4-bedroom showflat in District 10. The designer uses a palette of shades of grey with pops of colour and mirrored finishes for a touch of shine. 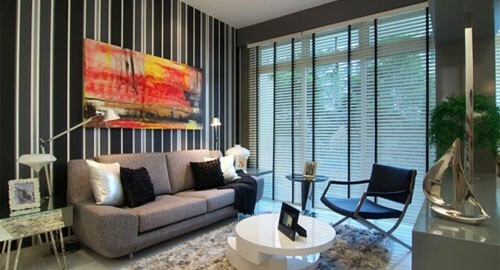 Stripes of greys and white in varying thickness inject fun and intrigue in the backdrop of the living space. A bold vibrant artwork hangs above the sofa, creating a focal point. Stainless steel details in the furniture and other glossy finishes add sparkles in the layering shades of grey. The thick shaggy carpet adds a soft touch of warm and cosy in the home. The fourth bedroom is transformed into an entertainment area and separated from the living space by the minimalist TV feature wall that is designed for maximum visual transparency while giving each area its own unique character. Shelving in pristine white and soft edging sit on the long bay window provide display and storage space. On either side of the shelving on the bay window are upholstered seating pads in rich royal purple for lounging by the window. A low height games table in mirrored finish with four stools in matching royal purple provide the perfect spot for a game of checkers with the family. The white pendant light in exquisite woven detail hangs over the games table anchors the space beautifully.